Israeli officials have agreed to release a convicted terrorist from prison early in the face of a 103-day hunger strike. An Arab security prisoner ended his 103-day hunger strike after Israeli officials capitulated to his demand for early release on Monday. Sivan Weizman of the Israel Prison Authority confirmed Akram Rikhawi ended his hunger strike, which has been the longest in Israel to date. Rikhawi, 39, stopped eating on April 12, demanding to be released on medical grounds. Pro-Palestinian Authority activists say he is suffering from asthma and diabetes. He was serving a nine-year sentence for transporting suicide bombers whose intended targets included Jewish civilians in Israel. He was scheduled for release next June. Kadoura Fares, an anti-Israel activist who has been supporting Rikhawi, told reporters that in exchange for ending the strike, Rikhawi will be released in January. 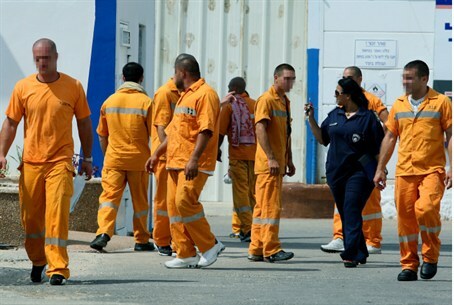 While Israel's Supreme Court has upheld prison terms for PA Arab security prisoners in the face of hunger strikes, Israeli officials have repeatedly backed down. This year, hundreds of security prisoners have staged hunger strikes to win early release or better conditions. Observers note that the hunger-strike trend began in Israeli prisoners after officials agreed to release Islamic Jihad terror leader Khader Adnan following his 66-day hunger strike. Unlike Rikhawi, who is serving a term following a conviction in court, Adnan was protesting an administrative detention order requested by Israeli security officials. Analysts say the decision by Israeli officials to release Rikhawi shows an increased weakening of Jerusalem's resolve in the face of negative publicity garnered by hunger-strikes.